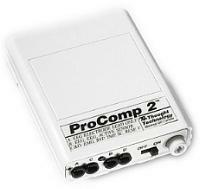 Our top-of-the-line encoder is the ideal data acquisition and physiological monitoring device for power users. 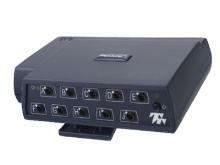 It offers 10 high-speed channels (2048 samples/sec). Researchers, surface electromyography (SEMG) specialists and ergonomists will appreciate its ability to monitor and record SEMG and displaying it as raw, median frequency, RMS, peak-to-peak, 2D and 3D frequency and power spectrum. Up to four encoders (each using up to 10 channels) can be connected simultaneously to produce the largest possible “window” into the subject’s physiology. FlexComp Infiniti™ offers internal, user-activated calibration to ensure that you can always obtain the highest quality signal, without the costly downtime associated with factory re-calibration. FlexComp Infiniti™ is a total monitoring and biofeedback system with a wide range of applications in psychology, physiatry, clinical research, physical therapy, primary care, and sports medicine. Compact and easy-to-use in tethered and un-tethered situations, using fiber optic (for real time monitoring) or Compact Flash (for remote data storage) modes, FlexComp Infiniti™ offers a tremendous range of capabilities and the power to deliver instantaneous analysis of complex data. When combined with Infiniti software FlexComp Infiniti™ provides flexible, high-speed processing of high-resolution data and allows clinicians to choose from a full range of user-defined screen configurations for specific applications or client profiles, using mouse or keyboard controls. The BioGraph Infiniti software is created in a modular fashion to ensure you get only what you need and do not fill your computer’s memory with unwanted software. With a flick of a dipswitch the FlexComp Infiniti becomes a ten channel ProComp Infiniti with the first two channels sampling at 2048 and the remaining eight at 256. The FlexComp Infiniti system comes with EEG, Physiology, and the DynaMap Suites. The Developer Tools will allow for high end users to create their own screens, scripts and channel sets. This ultimately provides the customer with the most variety under one system. The Z-Score Mini-Suite (NEW) includes everything you need for two and four channel z-score assessment and training. Individual z-scores, metrics describing the overall state of a number of z-scores, as well as z-score with standard EEG band amplitudes in parallel. All this with the feedback features of BioGraph Infiniti including DVD playback, AVI Animations, and single and dual monitor displays. Take advantage of the full power of BioGraph Infiniti by using Quick Start favorites, which allow you to start a session, review, report and analyze statistics with the click of a single button or even a desktop icon! FlexComp Infiniti Professional Biofeedback System - Call 212-222-5665 - FlexComp Infiniti Is A Monitoring & Biofeedback System with Applications in Psychology, physiatry, clinical research, physical therapy, primary care, and sports medicine. FlexComp Infiniti provides flexible, high-speed processing of high-resolution data and allows clinicians to choose from a full range of user-defined screen configurations for specific applications or client profiles, using mouse or keyboard controls.